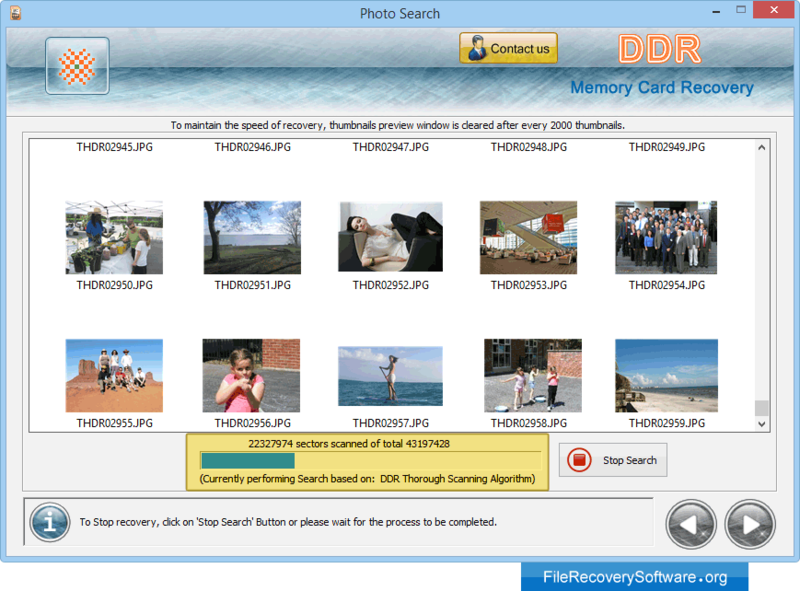 Memory card file recovery software to recover files that have been lost, deleted or missed from memory card mass storage media. Professional file recovery program easily retrieves all your lost data, music file, picture folders and other forms of digital data. 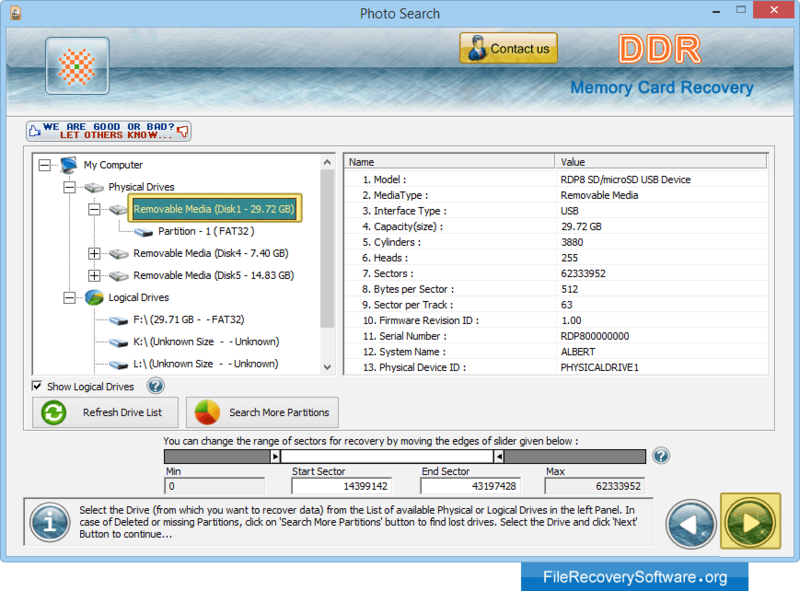 Memory card file retrieval program works with variety of memory card formats including: Compact Flash Card, PC Card, SmartMedia, Multimedia card MMC, xD-Picture Card, Memory stick Duo, Memory stick Micro M2, MicroSD, MiniSD and other popular multimedia card formats. 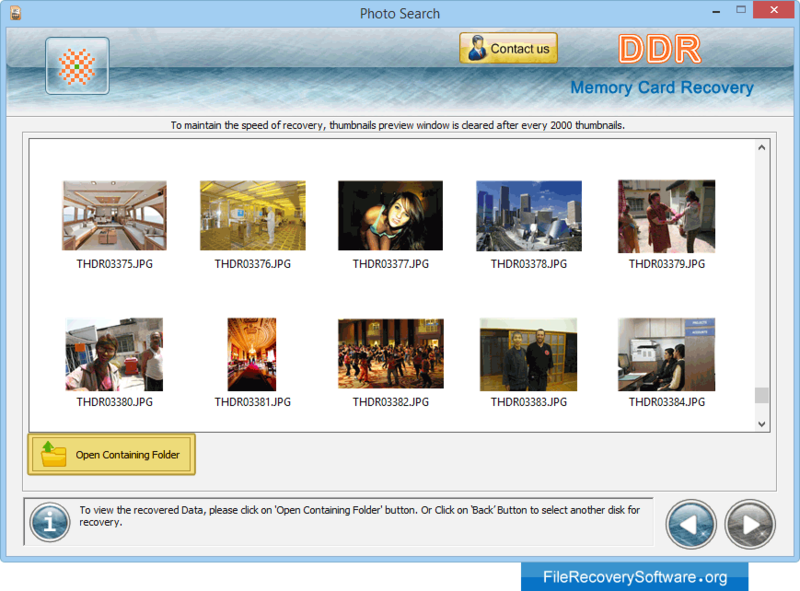 Memory card recovery software offers secure retrieval of inaccessible pictures, images (jpg, jpeg, gif, png, tiff etc), audio/video files, music tracks, songs (avi, mpeg, mov, wav, wmv, wma, mp3, mp4, aac etc), documents (doc, docx, xls, ppt, mdb etc) from major branded memory card formats. Utility get back lost data even if “Memory card not formatted” etc common system generated error message is displayed while accessing USB removable media in My Computer Drive. Software deeply runs disk scanning techniques named Advance Search, Standard Search and Raw Search to closely scan memory card and to find, repair and restore lost or deleted data. Software is built with additional features to undelete and unformat all your important files and folders from major branded memory card devices including Transcend, Toshiba, Olympus, Kingston, Sony, Samsung, Panasonic, SanDisk, Kingmax, Konica-Minolta, Fujifilm and other popular memory card manufacturers. 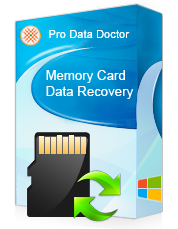 Fully compatible to support easy data recovery from 512MB, 1GB, 2GB, 4GB, 8GB and even higher capacity memory card devices. 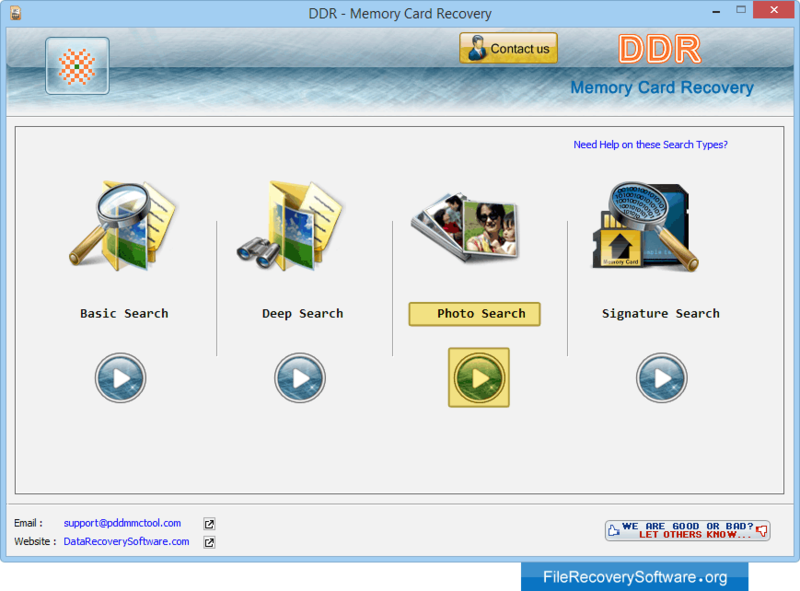 Choose recovery mode among Basic Search, Deep Search, Photo Search and Signature Search. Here we have selected "Photo Search" for demonstration purpose. Select the disk or partition from left panel from which you want to recover data from the list of available Logical or Physical Drives. Data has been recovered. Now select Files and Folders from left panel directory tree and click on "Save Data" button to save recovered data.